Daily toothbrushing is the best at-home method for maintaining good dental health for cats and dogs. Virbac offers a complete line of specially designed toothbrushes aimed at making it easy and effective for cat and dog owners to care for their pet’s teeth as part of their daily routines. Long handle with reverse angle allows for easy application in dogs or cats. Tapered end conforms to pet’s mouth and teeth. 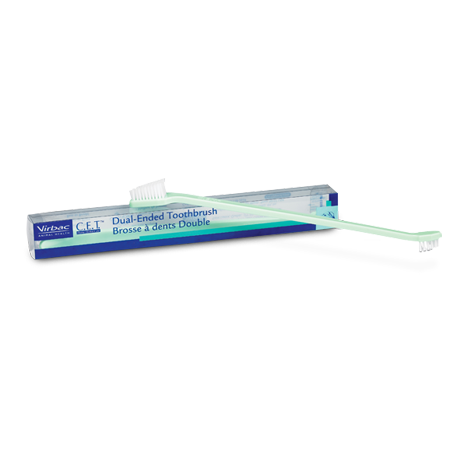 Dual-ended for large and small tooth surfaces. Soft bristles ensure a gentle, well-tolerated application. Each brush is individually packaged and comes in assorted colors. We all love to get up close and personal with man’s best friend, but if your dog has stinky breath, it can be almost unbearable. Not only does smelly breath bother a pet’s owners, bad breath can also be somewhat offensive to guests! Below are some of the causes of bad breath in dogs and some ways to treat it so your dog doesn’t have to be embarrassed to come in for a wet one!